The next generation tug is here! The all new Ranger R-29S (sedan) is another masterpiece of innovation! The more modern styling features a curved front window and an overhead glass atrium that provides exceptional visibility from the helm station and salon area. An ingenious aft cockpit seating arrangement includes a reversible seat, port and starboard jump seats and a teak table for outside dining. The opening cabin bulkhead with reversible seat also provides additional cockpit seating while bringing the outside-in. 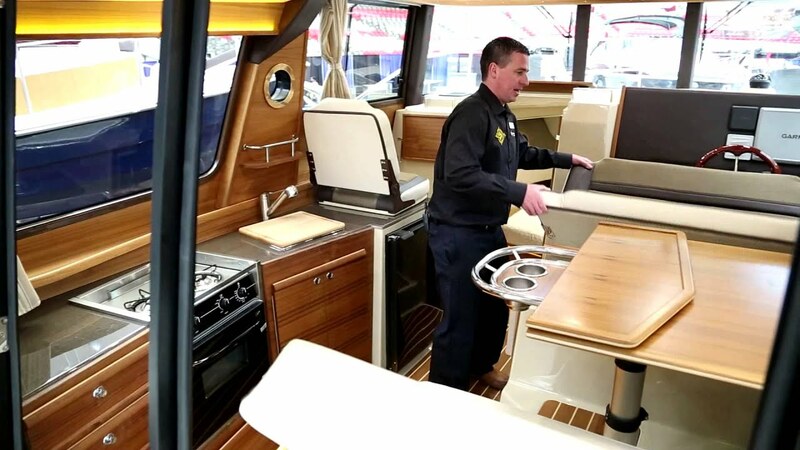 The new Ranger Tug 29S accommodates up to six adults on three separate berths, including the forward island berth with en-suite head. The R29S is powered by a fuel efficient 260 HP Volvo Inboard Diesel engine that is located completely outside of the cabin for quiet cruising. Standard stern and bow thrusters make docking exceptionally easy.